We've always made our own chick starter by grinding and mixing some of our organically grown grains. 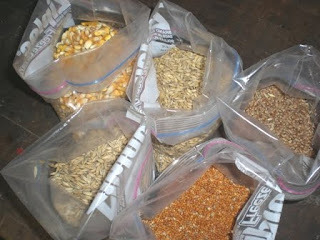 In equal parts we mix corn (and going around clockwise), barley, wheat, (red) millet and oats. They get ground up to a fine consistency in our faithful, ol' Corona mill powered by Papa Pea. 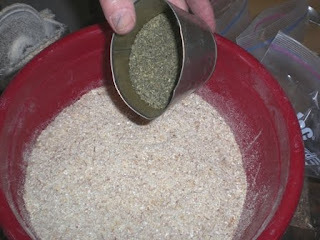 We also mix in some kelp, about 1 teaspoon to every quart of ground grain. This grain mixture, lots of fresh water, a little finely ground grit and an occasional hot fudge sundae (I'm KIDDING) and our chickies are happy little fuzz balls growin' like crazy. You mean you can't give chickens hot fudge Sunday's??!? Well mine will not be happy to hear this development. And if Sunday's are involved I just know I can get the husband to help with chicken duty. Jane - Yeah, but if you get the husband to help, the chickens may never SEE the sundaes!! I think they SHOULD get sundaes. I think we should ALL get sundaes. Hot fudge sundaes with peppermint stick ice cream and whipped cream. I haven't had lunch...I really commend you for making your own feed. I am constantly reading the bag to see what is in the chick feed and then worry about where it was grown. I want to grow all my grain for the animals -- not there yet. If they don't get hot fudge sundaes, I bet you pick them some clover every little bit! Susan - Can't you just see me chasing each little chick around with this teeny-tiny little wash cloth trying to whip the chocolate sauce off their beaks? Dr. Momi - The way chicks always grow, they're gonna be out on their own green grass before we know it. That is if it EVER warms up enough around here! Geesh. Susan - "Whip the chocolate sauce off???" Make that w-i-p-e. Thanks. You AMAZE me! I'm still trying to use up our store bought flour so I can more seriously entertain the notion of grinding our own for bread and you are grinding fresh starter LOL! Aw, no hot fudge sauce for the peepers? LOL Thanks for this! Great to know what to do and what to use. We're working toward growing our own feed, so this is very helpful. I'd never waste a hot fudge sundae on a chicken! Right now we are eating chocolate cheese cake that the husband baked me for Mother's Day. Post some more pictures of your chickens. I can never get enough animal pictures. Leigh - I learn so much from you I'm thrilled to be able to pay you back just a little. judy - Yes, there are days like that. You hang in there, Girl! Sparkless - Your husband BAKES??! How fantastic is that! I'll get some more pics of the little peepers . . . tomorrow maybe? Where could I get the grains to make this myself? Since i would not be able to grow these all myself. Also they would need to be organic right? Anonymous - We choose to use only organic grains as we feel that gives us the best quality eggs and meat from the chickens. Each area of the country usually has farmers or a feed store that carries whole grains so a search of same in your area would be a place to start. Good luck! Do you feed oats to your adult chickens with no problems? Oats makes hens infertile. Julie - Gosh, we've never heard that oats make hens infertile! We've fed our chicken oats for nearly 50 years. We usually have one or two hens go broody and hatch out a batch of chicks each year. 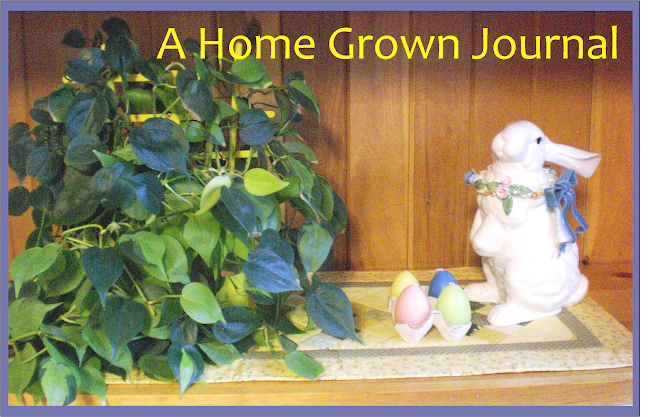 We've had duds with goose eggs that didn't hatch but not with chicken eggs. I give, why ground up so fine??? loyda - Because of the little chicks' inability to swallow or digest the grains in larger pieces. Is this starter good for meat birds like cornish cross? I guess I read that they need a high protein content?? Can you help me out because I am getting my birds in a few days and would LOVE to make my own starter...THANKS! Judy W - All chicks need a high protein diet to grow well. The chick starter we use should be just fine for your meat birds. Good luck with them. P.S. Along with the grains mentioned in the post, we also throw in some field peas and sunflower seeds (ground, of course) on occasion. Janet and Susan - No, we don't make our own laying mash. Not that it couldn't be done. You'd just have to gather all your grains and supplements and have some kind of an electric powered grinder. Doing it with a hand crank grinder would be very time consuming if you have more than a couple of chickens. We have a farmer friend who lives outside of the biggest city near us where we go to get building supplies and do other shopping. Even though it's about 3 hours to his farm one way, we always combine trips for supplies and stopping at his place to pick up several hundred pounds of feed. He's not certified "Organic" but is as close to it as he can get so we're very pleased to be able to get the ground laying mash from him. Hope this info helps. You can give them Frozen watermelon, or frozen strawberries, or mushed banana's ! To them it would be like a sundae! It keeps them cool in the hot summer months and hydrated too! And it's a healthy alternative. We also give ours frozen ice blocks with veggies in them . They love them! Especially in the hot month's when they eat less grains! I have mixed in mashed banana and peanut butter as well as 9 grain/seeded bread. My little Mille Fluer D'Uccle follows me into the house and up on the countertop to make sure I'm making it! She gets so excited she jumps onto the bowl. Oh...let me explain...she has a crossed beak and I have to make a mash for her to eat. Now the 6 other chickens (silkies) eat her mash. They are spoiled. So how much corn, barley, millet, oats, and wheat did you grow to get enough and how long will it last? We have searched and tried all the local organic feeds in our area, but it still just costs so darn much! They are out on grass/pasture all day free ranging and just get fed once a day. Also, where do you get your kelp? Thanks for any info! cindersga - Sounds to me like ALL your chickens are spoiled! They sure are fun, aren't they? 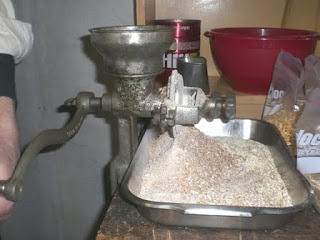 Tamara - Sad to say, we're not set up (yet) to grow our grains but have sought out sources from organic farmers. Sometimes we have to travel quite the distance to get what we want but it's a price we pay for living so far from farming territory. We get our kelp from Midwestern Ag . . . if I'm remembering correctly. The grains will last a long time if you have a cool place to store them and can keep the insects and varmints out of them. Anonymous - Better watch out or your chickens will be asking to have their corn popped and buttered! I was told by the local feed mill to feed my chicks medicated feed. Was this a bad idea? Did I get a 50lb bag for nothing? I'm worried I'm feeding them something that can harm them after reading so many blog posts about not using medicated. andrea6479 - We try to stay away from any "medications" that aren't natural or truly needed. I think medicated feeds came in when hundreds (probably thousands!) of chicks were being raised by commercial operations and conditions weren't able to be controlled as well as we homesteaders can do. You can keep clean conditions, lots of fresh water and natural feeds for your little chicks without much trouble. Just remember that anything the chicks (or chickens) eat is going to be in their eggs and/or meat. Just as with humans, the more antibiotics (or medications) animals ingest, the less likely they are to develop their own strong immune systems. How many weeks can I feed this? Can I feed this until its time to start laying feed around 18 weeks? Anonymous - Yes, it would be fine to keep them on the chick starter until around 18 weeks IF as soon as they are feathered out, you can get them out so they have access to green pasture, bugs, worms, etc. as a supplement. Something like a chicken tractor would work great for that. Good luck with your chicks! Anonymous - You're very welcome!